10 DECEMBER 2015, MUMBAI: Radhe Maa devotees rushed to Damu Nagar in Kandivali, Mumbai after a number of cylinders caught fire and exploded leading to the death of two people and left several in injured and homeless including women and children. 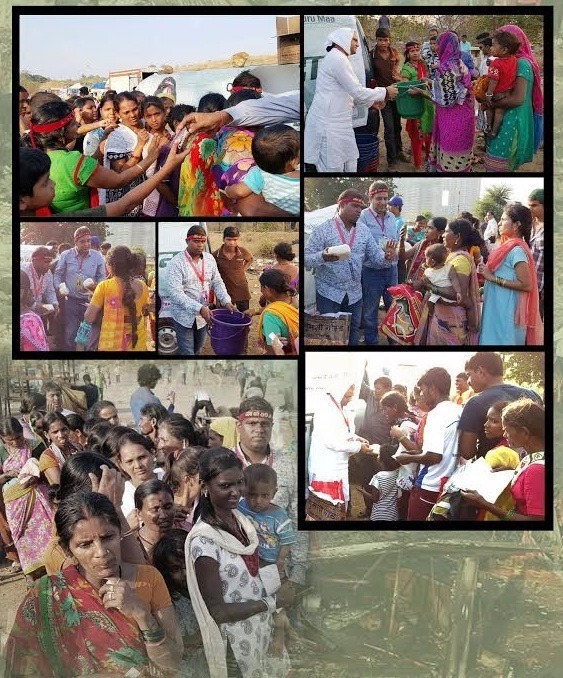 The devotees helped with donations of 100 kgs of rice, 35 buckets and 4 cartons of biscuits. “We had to see the situation with our own eyes. We realise that more needs to be done and we will. However, we were told that we could help by arranging for these items to begin with and we did. We are keeping a close eye on ways to render further assistance,” said Sanjeev Gupta, a devotee of Mamtamai Shri Radhe Guru Maa. Mamtamai Shri Radhe Guru Maa is a teacher of the Sanatan Hindu tradition whose teaching emphasize on the need to take bhakti bhaav beyond the temple to society where people are served as one would serve God himself.